The small Yakut village of Oymyakon is known as the World's coldest permanently inhabited place. The surrounding area is also the one with the most continental climate: temperatures reach 42C (108F) in summer, but drop to -70C (-94F) in winter. This part of Northeastern Siberia is one of the less-known and less-visited places in Asia. Its unique beauty attracts less than ten tourists a year, almost all of them Russians. The main access route is the so-called Kolymsky Trakt (Kolyma Highway) - a dirt road from Magadan city on the Sea of Okhotsk to the infamous gold mines in Kolyma River valley and surrounding mountains. You can hitchhike along this road, as heavy trucks make this journey and come back with gold and uranium ore. It usually takes one-three weeks one way. Kolyma Valley, Russia. After you cross Kolyma, villages and mines become scarce. Soon, you reach the Jack London Lake junction. This lake is said to be the best fishing place in Siberia, but there is almost no chance of hitchhiking to it. In summer, you can make this side trip (32 km/20 miles one way) on foot, if you have good insect repellent. This part of Siberia has almost no native population, and there is almost no reindeer grazing. 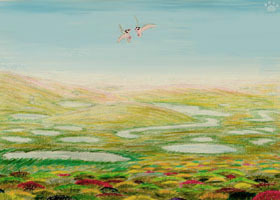 As a result, it is the last place to see "yagel forests" - tundra-like layer of lichens up to 30 cm (1') tall. Try walking barefoot on it - great massage! Brown bear (Ursus arctos ognevi), Ust-Nera junction, Russia. Just before the town of Ust-Nera, there is another major junction. From here, the longest, wildest, and most difficult part of the road begins in summer (in winter you have to go via Ust-Nera - the road changes slightly, as it goes on surface of frozen rivers). Be ready to wait for the next truck for a few hours or days - there is very little traffic beyond this point! Once, while waiting here, I was visited by a bear and had to give it my last couple of crackers to avoid aggression. If you don't want to take this risk and go beyond Ust-Nera, you can try to arrange a helicopter trip to Indigirka River Gorge instead. Labynkyr Lake, Yakutia, Russia. Soon, the road enters Yakutia and passes within 65 km (40 miles) of Labynkyr Lake in a large impact crater. This deep lake is believed to shelter a lake monster like Nessie, but smaller and more crocodile-like. 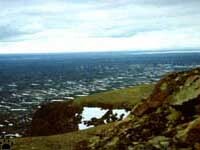 Surrounding mountains are populated by Even and Evenk tribes - probably the most ancient peoples in Asia. These nomadic hunters once traveled with small herds of domestic reindeer between the Pacific Coast and the Urals. There are a few toponyms of Evenk origin as far west as the Moscow area. Oimyakon Basin itself looks a bit dull in summer - tiny larch trees, dry grass, low hills around. On south-facing slopes, you can see the last remains of the so-called tundrosteppes - the type of grasslands that used to cover most of Siberia and Alacka about 10000 years ago, before the climatic change caused the replacement of tundrosteppes by taiga forests. These grasslands, once home to mammoths, bison and rhinos, still have some relict species of plants. Tundrosteppes can also be seen in a few places in Northern Mongolia and on Vrangel Island off Chukchi Peninsula. 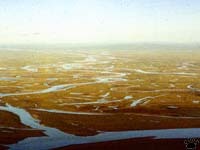 Oimyakon Basin, Yakutia. In winter, these basins become a natural trap for cold air. Siberian Anticyclone creates sunny weather through most of winter, and ice crystals grow to the length of 10 cm (4") on grass, bushes, trees, and houses. They also grow in the air itself: if you look towards the sun, you can see plenty of tiny "sparkles" flying around. But there is very little snow in these frozen valleys. Oimyakon, Yakutia. Ice also grows inside houses, especially around windows, doors or microscopic pores in the wooden walls. But don't be scared: it can be frosty in one corner of a room and warm or even hot in the other one, close to an oven. Local hotels, by the way, are usually comfortable - the only problem is that they are sometimes a few hundred miles apart. Wild animals come down to the foothills from surrounding mountains to feed on grass, as it is not snow-covered here. Surprisingly, many species can tolerate Antarctic-like frost: Siberian bighorns, wolves, reindeer, wolverines, foxes, Arctic hares, lynxes, many small mammals and birds. North from Oymyakon, Yakutia. People living in these basins have to fight frost for up to seven months a year. Starting an engine requires such an effort, that most truck drivers keep them running all night while they take a nap in roadside inns. Trucks usually survive for only 2-3 years under such conditions. Fortunately, frost is almost never combined with wind, and the air is usually very dry. In early March of 1992, a friendly helicopter pilot dropped me off in a remote basin north from Oymyakon - an excellent place to observe wildlife. What we did not know was that the only wooden cabin in the area had been destroyed by October storm. I had to hike more than 60 km (40 miles) to reach the Highway. If the air was more wet, I would be dead in 4-5 hours, but I managed to walk all the way at -60C (-76F), and only got my cheeks and tops of lungs slightly frostbitten. The snow was only two inches thick, so hiking was easy. mines, Russia. Some of the mines in this area have been used as labor camps during Stalin's time, but most of them are long abandoned. Following old roads, you sometimes get to dilapidated remains of wooden barracks and barbed wire fences, now used by foxes and shrikes. Skulls from mass graves are sometimes offered to foreigners as souvenirs. Late August is a very beautiful time here. Normally the snow cover forms in September, but it can also be August or October. In some years, weasels, hares and ptarmigans turn white too early, and they are killed by predators in great numbers. In the following years, lynxes and gyrfalcons are in decline, as lynxes feed mostly on hares, and gyrfalcons on ptarmigans. Naled, Corpse Canyon, Yakutia Soon after Oimyakon, the road enters the deep gorges of Suntar-Hayata (Misty Mountains). Driving on frozen rivers is dangerous here: they often freeze all the way to the bottom, and then break through ice barriers, instantly flooding canyons downstream. Numerous floods create bright-blue glacier-like ice shields called naled in Russian or taryn in Yakut. Some of them are more than a hundred miles long and melt completely only once every few years. Traveling in the canyons in winter, you must be very careful - although the air seems warm compared to Oimyakon, it is also less dry, so it takes just a few minutes to get your lungs and face frostbitten, and less than half an hour to freeze to death if you are not equipped properly. Narrow canyons of Suntar-Hayata enjoy relatively mild climate, with a few feet of snow and temperatures above -50C (-58F) in winter. If you enter this world of dark-blue shadows, green rivers and black rocky slopes from the barren plains of Oimyakon, you feel like driving through tropical jungle. In some places the microclimate even allows spruce trees (Picea obovata) to grow, which is very unusual for larch-dominated Eastern Siberia. During short summer, plenty of flowers can be seen on riverside meadows and mountain tundras. Lady's slipper orchids (Cypripedium) are very rare even in the most remote canyons of Yakutia, but more common in Southern Siberia. Some rare and beautiful flowers, normally found only in Southern and Western Siberia, can be seen around hot springs in the uninhabited area between Suntar-Hayata and Verhoyansky Range. In this mountain chain, 3 times as long as Sierra Nevada, there are only two small villages and three mines. Hot springs do not freeze in winter, and I discovered a wintering population of brown dippers (Cinclus pallasi), diving in the water despite the frost. Marmots (Marmota camchatica), bighorns and other species inhabit this range all the way north, to the Arctic Circle and beyond. Bighorns, reindeer, moose can be seen anywhere except the 50-km vicinity of roads and settlements. But don't expect them to be as easy to approach as in Canadian parks! They can only be seen with good binoculars. Members of geological expeditions, local tribesmen and helicopter pilots are all armed with rifles, and all are used to poaching. Foreighn trophy hunters sometimes order expensive helicopter tours to shoot a helpless bighorn. Bighorns, bears, marmots and musk deer are already extinct in more accessible parts of Yakutia. 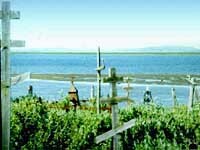 Ayan, Okhotsk Sea coast. Marmots and bears are hunted for their fat and bale, believed to have medicinal value, while musk deer are hunted for males' musk glands. These small, shy creatures inhabit the darkest forests with lots of windfallen trees, where they create networks of trails to move quickly and quietly through their territory. They feed almost entirely on Usnea and other tree lichens. In early spring, capercallies and ptarmigans start lekking in hillside bushes. Capercallies mostly feed on larch buds during the winter. To make this food source more accessible, they trim trees, so that a heavy bird can reach buds on small twigs from its perch near the trunk. As a result, capercallies create the so-called "gardens" - small areas of trimmed trees. They are difficult to find, as black capercallie populations are small, rare and far between. Gallinaceous birds, especially hazel grouse, are a rare sight in winter, as they spend most of time in dens under snow surface. Other large birds wintering in the area are owls, white goshawks (Acipenser gentilis albidus), ravens and (the most common) Siberian jays (Perisoreus infaustus). Handyga, Yakutia. By June, the winter is normally over, but snowfalls can occur until early July. For 50-70 days a year, it is warm along Kolyma Highway, especially along its last, westernmost part between Handyga on Aldan River and the city of Yakutsk. Here, mountains end abruptly, and the road crosses Central Yakutian Plain. Summer temperatures are often above 40C (104F) here, still the permafrost is up to 70 m (235') deep. Melting permafrost creates unusial karst-like formations - hills, sinks, "stumps" of soil. Some of them have names only in Yakut language: berellyoh, bestyah, berdegestyah etc. Finally, you reach Yakutsk - large city with an international airport and bus connections to Baikal-Amur and Transsiberian railroads. In a few years, a railroad is supposed to reach it from coal and gold mines in Aldan Highlands. Not far from Yakutsk, a project called "Pleistocene Park" is underway - an attempt to recreate tundrosteppe ecosystem by reintroducing reindeer, wild horse, wood bison, and, if cloning attempts will be successful, whoolly mammoth. A few hours upstream from Yakutsk there are the famous rock formations along Lena and Blue Rivers, called stolby (pillars). Taking a boat along Lena, you can reach either Tixi on the Arctic Coast, or Ust-Kut not far from Lake Baikal. There is also a road going west from Yakutsk, to the diamond mines ans salt hills in Vilyuy River basin. Sunset, Aldan Highlands, Russia. Aldan Highlands of Southern Yakutia are rich with gold and coal deposits. Most rivers have been poisoned by gold mines, and forest fires are common. Burned slopes soon become covered with willow herb (Epilobium). When it is blooming in mid-summer, the hills turn bright-red, especially at sunset. In winter, this area gets much more snow than the valleys further north. Lake Baikal is not to be missed by anybody travelling in Siberia. It is exceptionally beautiful in all seasons, and there are some natural wonders in the area - strange ice formations in winter, beautiful fall colors in autumn, rare wildlife in summer, and pupping seals in spring. Lake Baikal. The lake is of special interest to meteorologists and zoologists because of its unique weather patterns, such as sarma, and more than 200 species of endemic creatures in the lake itself. Only two other lakes in the world have similar levels of biodiversity: Tanganyika in Africa, and, to much lesser extent, Ohrid in the Balkans. You can dive in most parts of Baikal, but the water temperature is above 12 C (54F) only in some parts of Chvyrkui Bay on the eastern side, and only in July and early August. The famous nerpa (Phoca sibirica), the World's smallest seal, is difficult to see. It spends most of winter in caves between ice and snow, but can be seen in spring on melting ice fields, or in summer on small remote islands. Most tourists cross Siberia along the well-known Transsiberian Railroad. I find this route dull and way too long. The surrounding areas were all colonized by Russians many decades ago, so you see identical villages, towns and secondary forests almost everywhere. The new Baikal-Amur railroad (BAM) to the north of the Transsiberian passes through more diverse and spectacular lands, high mountains and deep rift valleys. The surrounding forests have also suffered serious damage from logging and fires, but now, as the railroad is almost non-operational in some parts, they slowly recover. The older Western BAM is now surrounded with dense taiga, mostly spruce and pine. Chara Sands and Kodar Range, Russia. One of the most beautiful places along BAM is Chara Valley south from Kodar Range, famous for its rock climbing sites. From Chara eastward, almost all forests are larch, and many areas look like tundra woodlands. Eastern BAM is less populated, and passenger trains only pass there once or twice a day in each direction. Small stations are good starting points for exploring surrounding mountains and valleys. There is only one species of chipmunk in Siberia (Tamias sibiricus), but you see it everywhere, and in taiga forests with "cedar" (pines Pinus sibiricus and P. koraensis) it is the most common mammal. Local tribes use its caches of pine nuts in winter, and bears do so in autumn. European squirrel (Sciurus vulgaris) is also widespread, and some local races are very beautiful in winter. Flying squirrel (Pteromys volans) is common, but difficult to see. Tynda vicinity, Russia. In March 1997, I organized a trip to the eastern part of BAM to watch the total solar eclipse. I did some advertising via Internet, but most people did not dare go to a place so cold. Only 4 tourists from Canada and Hong Kong joined me. We enjoyed the longest totality time, excellent weather, and beautiful setting. A wolf pack saluted the event from a neighboring valley. We also saw Comet Hale-Bopp during the totality, and I sent a report to one of comet-watching sites. Meanwhile, thousands of people tried to watch the eclipse from Mongolia and China, but saw almost nothing because of bad weather. 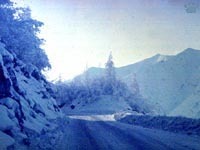 The territory north from Kolyma Highway is mostly mountains. Only the large area adjacent to the East Siberian Sea is absolutely flat. This lake-dotted country between Indigirka and Kolyma deltas is almost uninhabited. Native Yukagir people have mostly died out when herds of wild reindeer disappeared because of hunting on wintering grounds and competition from domestic reindeer of neighboring tribes. Their fate was shared by Inland Eskimos of Canada and other tundra hunters who didn't have domestic reindeer. of Yukagirs are decorated with wooden geese. Lake tundra, Pohodsk, Yakutia. In the old village of Pohodsk on Kolyma river, there are still some Yukagirs, but most people are descendants of Russian Cossacks. They settled here after "seeing a rainbow of unearthly beauty" in the late 16th century. The village was later decimated by smallpox epidemic, and now there are only a few dozen people here. The village cemetery has received some recent attention as a potential source of smallpox virus. It has been almost washed away by Kolyma, but some coffins are still visible in the permafrost. The maze of small lakes and willow-covered lowland tundra west of Kolyma is known as the main breeding area of Siberian crane (Grus leucogeranus) and Ross' gull (Larus roseus). In winter, it is the most desolate of all Eurasian tundras. Mountain tundras east from Kolyma have more diverse flora and fauna, with some American species. The diversity increases as you move east, into Chukotka. Cliffs on this picture, a famous nesting site of white gyrfalcons (Falco rusticolus), are, in fact, a more important biogeographical border than the Bering Strait. Edge of mountain tundra, Cherskii, Yakutia.